Contemporary capitalism is eating its tail, yet the failed experiment that was the Soviet Union had given socialism a bad reputation. A new vision is needed that combined “social struggle from below and bold state intervention”, according to panellists at an anti-poverty seminar this week. By STEVE KRETZMANN. Creating an alternative to capitalism is crucial if we are to address the ecological, social and economic crises affecting South Africa, and the world. If we don’t focus on a political solution to reinventing public power, the alternative will “in practice be constructed in struggle”, argues Professor Ben Cousins, who is DST/NRF Chair in Poverty, Land and Agrarian Studies at UWC. Speaking at a seminar organised by the Institute for Poverty, Land and Agrarian Studies (PLAAS) on Monday, Cousins was proposing a reinvention of Socialism as a possibility to address the crises of unemployment, poverty and inequality our mix of post-194 neo-liberalism and social democracy has largely failed to solve, as well as the ecological, social and economic crises affecting much of the rest of the world. Other than South Africa’s current “disaster” of “gangster capitalism” under President Jacob Zuma, our central challenge is achieving pro-poor economic development, he said. Flanked by fellow speakers Jeremy Cronin, who is Deputy Minister of Public Works, former Cosatu Secretariat strategies co-ordinator Neil Coleman, and visiting Professor Issa Shivji who is director of the Nyerere Resource Centre at the Tanzania Commission for Science and Technology, Cousins admitted the failed experiment that was the Soviet Union had given Socialism a bad reputation. However, contemporary Capitalism was a system that is, he quoted critical theorist Nancy Fraser as saying, “eating its own tail”. Leaning on Fraser, Cousins said capitalism relies on legitimate public power to govern social life, and depends on the exploitation of the natural world as both a source for materials and a sink for waste. Yet in her analysis of financialised, globalised capitalism, it is undermining “the very idea of legitimate public power to govern society”, and our exploitation of the natural world is resulting in rapid global warming that threatens our continued ability to survive on this planet. “So capitalism’s own needs for these conditions to reproduce itself are themselves under threat from the logic of capitalism itself,” echoed Cousins. He believes a social democracy, as proposed by former head of the Government Technical Advisory Centre, Andrew Donaldson, even in it’s ideal form, was at best a short to medium-term solution while we constructed “a systemic alternative to capitalism”. An effective alternative, he says, needs to be global in reach and must be regarded as feasible or, if not, it risks being captured by “retrogressive ideologies such as nationalism and populism”. Such capture, paradoxically, is evident in the rise of Donald Trump, who was seen as an alternative to globalisation and the financialisation of the US economy. Apologising for the panel being all male, and predominantly white male at that, Cronin, with his long association with the SACP, didn’t take issue with Cousins’s suggestion that we re-look at Socialism. In fact our celebration of reinserting ourselves into a “happy international family” of nations in 1994 meant we missed an opportunity to forge a national sovereignty that rejected the “universal values”of neo-liberalism South Africa came to adopt, particularly under Thabo Mbeki. The policy of growth in order for redistribution of wealth to occur, rather than creating growth through development, led to the Reconstruction and Development Programme (RDP) being a “tick-box, top-down” redistributive programme, said Cronin. “The notion of what we were doing was reinserting ourselves as prodigal sons in the happy family of nations played into the hands of monopoly capital” which had been “locked up in South Africa (due to a successful sanctions campaign) and couldn’t get out easily”. The liberalisation of trade after 1994 was supposed to attract fixed direct investment the government was looking to redistribute, but the opposite happened; there was “a massive outflow of capital as they off-shored the huge surplus that had been generated in South Africa”, which made us very vulnerable to what he termed “the casino economy” of “short-term hot money inflows”. Cronin proposes a “relative de-linking” of our economy in favour of “national autonomous development”. Much like stokvels and informal burial societies adopted by communities among the poor, or what Cronin terms the “popular strata”, which use elements of the formal economy but manage and distribute funds according to rules that suit the community’s needs best, and are governed by the community members themselves, South Africa should use what elements of the global economy are suitable for its requirements and implement its own measures to suit its development needs. In this sense he agreed with Cousins’ call for rejecting our alignment with contemporary global capitalism in favour of a system that includes our social democracy wish list. We should look to China’s economic model, rather than that of the US or EU, but adapt it as required. However, South Africa does not have the economic clout or markets of a China or India, and for a start would have to “invent or re-discover a pan-Africanism or regionalism” which included sub-Saharan Africa. Cronin’s second point was the need for what he termed “popular sovereignty” in which working people are not tied to the dictates of the factory gate, but work for themselves and for community structures. This would include “minibus operators, crèches for kids in working-class townships, home-based care, food gardens, communal land tenure – if we can democratise it — productive land reform”. The state channelling the redistribution of surplus into these activities would “affirm popular productive agency” and help to “change the balance of class forces”. Capitalism, or at least the form we’ve inherited in South Africa, also came in for a drubbing from Coleman, which was not unexpected given his role in Cosatu. It was “extractive” and “parasitic”, he said, and “despite claims to the contrary, fiscal policy remains relatively regressive in relation to the challenges of poverty and inequality”. Capital, as represented by multi-national corporations, was not interested in the social democratic project. Rather, their strategy, said Coleman, was to “cream off the surplus” through speculative instruments; the building up of huge cash reserves (multi-nationals are currently parking about R1.7-trillion in the banks rather than investing); setting up of dual or primary listings outside the country and shifting surplus to finance offshore operations; tax evasion and the use of tax havens and various illegal and semi-legal means to facilitate capital flight. This, together with the de-industrialisation of our economy wherein the combined industrial sector constituted 29.9% of GDP in 2008 as opposed to 40% in 1980 and had worsened further following the 2008 global financial crisis, was “devastating for jobs as well as structural transformation”. Government had failed to implement the Industrial Policy Action Plan which contained good ideas related to beneficiation, regional development, local procurement, a developmental mandate for SoEs, and an infrastructure programme. He agreed with Cousins and Cronin that the role of the state, social sector and private capital needs to be re-imagined. But such re-imagining was not a technical economic question. A new vision could only be achieved through a combination of “social struggle from below and bold state intervention”. This was a political challenge, especially given the “emerging Mafia state in South Africa”. Shivji, in his turn, raised technical points with Cronin, Cousins and Coleman’s presentations but said from his Tanzanian perspective, it was essentially all hot air unless, or until, there was effective land reform. “I can’t see how you can address the national question or even a social democratic question in South Africa without addressing the question of land,” said Shivji. Once “fundamental land redistribution” had been dealt with, the state needed to prioritise the “social wage”, being the provision of education, health, water and other services, to which capital also had to be regulated to contribute. Lastly, he said, “the five monopolies” of land, banking and finance capital, communications, natural resources, and energy, needed to be owned by the public. 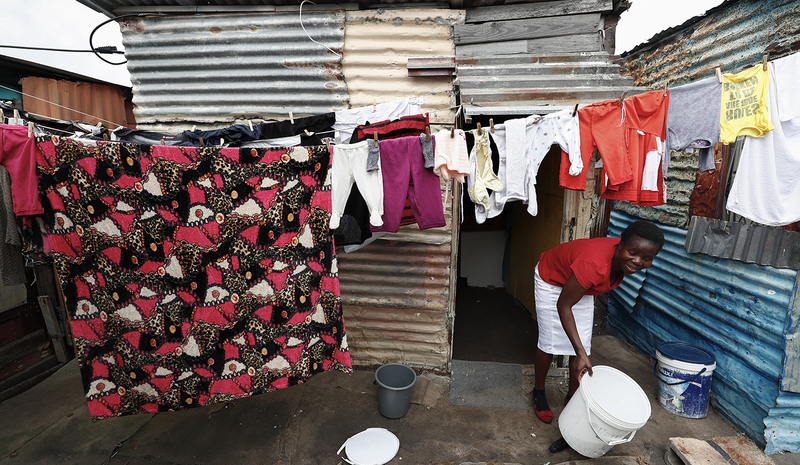 Photo: A woman washes clothes on the doorstep of her home in the impoverished shack settlement of Masiphumelele, Cape Town, 23 August 2017. According to Statistics South Africa’s Poverty Trends Report released on 22 August 2017 poverty is rapidly increasing in the country. Photo: Nic Bothma/(EPA).